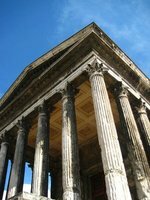 Nîmes is the capital of the Gard department in the Languedoc-Roussillon region, southern France. The city has around 150,000 inhabitants. Nîmes-Alès-Camargue-Cévennes Airport (FNI) only has flights with Ryanair to/from Brussels, Liverpool and London. The Gare de Nîmes is the central railway station, offering connections to Paris (high speed rail), Marseille, Montpellier, Toulouse, Perpignan and several regional destinations. The motorway A9 connects Nîmes with Orange, Montpellier and Perpignan, the A64 with Arles and Salon-de-Provence. This is version 4. Last edited at 14:23 on Aug 22, 16 by Utrecht. 3 articles link to this page.